Lord Willing, the 2019 Dumisani Graduation and Awards Recognition Ceremonies will be held on Saturday March 2nd at 10:00 am 2019 at Bethany Emmanuel Church near Shoprite in downtown, King William's Town. All are welcome. This will also be a special celebration event for the 40th Anniversary of Dumisani's ministry. ​Our guest speaker will be Rev. 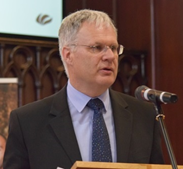 David Meredith from Edinburgh Scotland the Director of Missions, Free Church of Scotland and a noted speaker about church planting and church revitalisation. This will be his third time at Dumisani.